Home » Blog » The Dubs Amendment: what’s the situation? After 2015 saw the biggest movement of people since the Second World War, desperate people have continued to seek refuge in Europe in the subsequent months. In 2016 alone, over 5,000 unaccompanied children arrived by sea in Greece, and in Italy it was 5 times that, with over 25,000 arriving by sea. The Calais ‘Jungle’ camp was dismantled and its residents were distributed to around France, with some being relocated to the UK. Less than six months later, over 500 refugees are back in Calais. Without a camp to return to, and with the heavy police presence, these refugees have had to sleep on the streets in Calais and Paris. NGOs on the ground have reported violence by the police against refugees sleeping rough including, blankets and sleeping bags being stolen from them. The UK has continued to be one of the most generous bilateral financial contributors to the humanitarian response to the Syrian crisis but have left much to be desired in responding to the crisis in Europe. Many of the children who make it to Greece, Italy and France have escaped bullets and bombs, or recruitment into armed rebel groups in their home countries. They have already travelled through great danger, but the dangers they face do not subside once they reach the shores of Europe. They face huge risks of sexual exploitation, trafficking and modern slavery. The passing of the Dubs Amendment in 2016 was a commitment to protecting children close to our shores, irrespective of family links to the UK. 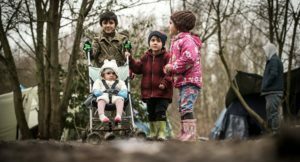 On the 8th February 2017 the Home Office announced that there were only 150 places available for children under the Dubs scheme, citing lack of local authority capacity to rehouse unaccompanied children as the reason for the scheme ending. Only 200 children had previously been relocated under the Dubs scheme before the announcement, meaning a total of 350 children would have been relocated by the end of the financial year. After engaging with local authorities and finding enthusiasm for taking in more child refugees, campaigners have attempted to keep the scheme alive beyond the financial year. Conservative MP Heidi Allen, proposed an amendment to the Child and Social Care Bill on 7th March 2017 for the Home Office to consult with local authorities yearly about capacity for taking in more children under the Dubs scheme. The amendment failed to pass with a 267 – 287 vote in Parliament. Despite this, campaigners are still pushing for the continuation of the Dubs scheme. Keep writing to your MP and local authorities and ask them to do all they can to see that the Dubs scheme is continued.